The Teen Economists: China's One Child Policy: a Good Idea? How big is your family? How many siblings do you have? If you'd been born in China, you wouldn't have any: you would be an only child. Is that fair? should a government be allowed to decide how many children a couple have? Whether or not a child has brothers and sisters to play with. Should anyone have the right to decide if a child has an enjoyable childhood? If you have siblings, think about all the fun you've had together. Of course you have your arguments, but above all, you genuinely have a good time together. I'm sure children with no siblings also have a fun-filled childhood; all the extra attention from parents must be great, but imaging doing all those exciting things with someone closer to your age to share them with. Wouldn't that be great? I'm not denying that China's one child policy is a sensible way to try and control their immense population problem: it is. But are the rights families and children are required to give up in order to enforce this too heavy a price to pay? China has very strict rules in order to enforce the one child policy. Breaching the policy results in a severe financial penalty for the offender(s). There have been so many illegal births that it has been estimated that the government has collected over 2 trillion yuan (£202.124236 billion) in social-maintenance fees (SMF) since the 1980s, and that's just from the families who didn't manage to slip through one of the many loopholes in the policy. In extreme cases where the family are unable to pay the SMF, the mother can be forced to have an abortion. In villages where the citizens have next to no rights, the illegal children are often taken from their families and sent to state-run orphanages. From there they're sold abroad for adoption. Before 1997, the citizens would be punished by having their houses torn down. It was after 2000 that their children started being confiscated. However, it is important to note that children are only taken from their families in villages where the government reigns wild and free. This sort of thing doesn't occur in the cities. It was inevitable that there would be consequences to drastically lowering the number of children born per year so suddenly, but the Chinese government did it anyway. The consequences have been so dire that they've created a problem that won't be anywhere near easy to fix: China's whole population is ageing. This means that life expectancy in China is increasing, but the amount of young adults in the country is plummeting at an uncomfortably fast pace. Is it possible for a country that's developing as quickly as China is to deal with what is now being called a demographic timebomb? I think we've established that China's one child policy was NOT a good idea, and in a future post, I will be exploring China's situation as a demographic timebomb and further complications this status could lead to. Until then, post your opinions in the comments section below. 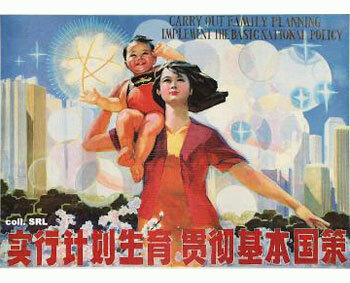 Do you think China's one child policy was a good idea? Will China be able to pull itself out of this situation? How? Well done and very well put!